If you’ve never been to Morzine before, you are missing out. It has a lot to offer skiers and snowboarders of all levels. But it’s always good to do some homework before you go on holiday, therefore we’ve put all the information together to make sure you know exactly what to expect before you arrive. Morzine is an old farming and mining village that installed some ski-lifts to bring in some income during the winter months. Its wooden chalets and farmhouses mean it has traditional Savoyard charm, unlike large purpose-built resorts. It’s also located in the Portes du Soleil, which is the worlds largest ski area. Its location also means that Morzine is very easy to get to. Most people fly, as it is just 80 minutes from Geneva airport. Those who drive can get to Morzine from Calais in around 9 hours. When you arrive it is always a good idea to have a walk around to get your bearings. It is also good to pop into the tourist office in the centre of Morzine. Here you can get piste maps and all the information about what will be going on during your stay. You are never far from anything in Morzine, as it only takes about 10 to 15 minutes to walk the length of the village (maybe a bit longer in ski boots). 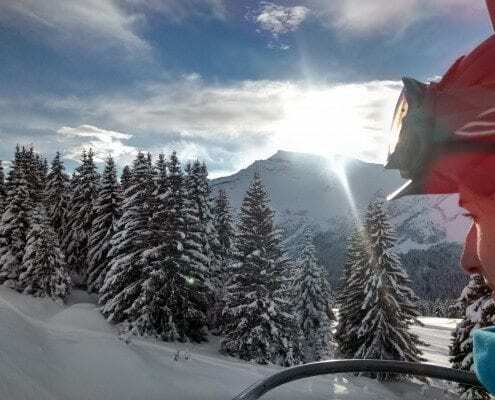 Where should I ski in Morzine? It’s really easy to get to the ski lifts from all of More Mountain’s properties in Morzine. They are within easy walking distance to the lifts or bus stops. Their chalet hosts will even drive you to the lifts from your chalet and bring you back at the end of the day. The five main lifts you need to know about are Nyon, Pleney, Super Morzine, Prodains and Ardent. These lifts are the telecabines and bubbles that get you off the valley floor and into the various ski areas. Nyon is most easily accessible by the Nyon cable car. It has a few nice, wide red and blue runs that link to Pleney and Les Gets. It also has a freeride area, which is an un-pisted area great for powder days if you have the necessary equipment and skills. From the top of Pointe de Nyon, it is possible to see Lake Geneva in one direction and Mont Blanc in the other on a clear day. The bottom of the Pleney telecabine is located in Morzine itself. It gives you access to the Morzine and Les Gets side of the valley. Here is ideal for beginners and intermediates as there are loads of fun tree lined blue and red runs to enjoy. More advanced skiers and snowboarders can head for the Nyon and Chamosiere areas. Pleney is a good option if the weather is bad too, as the trees provide some visibility, and you can get back into town pretty quickly for a vin chaud if it gets worse. The Super Morzine lift is a bubble lift on the opposite side of the valley to the Pleney. This lift gives you access to Avoriaz. It takes about 30 minutes to get to Avoriaz, via the Zore and Proclou chairlifts and an easy green run. This route means you are on the snow much quicker than you would be taking other routes. There are some great runs in Avoriaz and it boasts an impressive snow park and halfpipe. This is usually where the best snow is too, so it is worth heading up there. Avoriaz gives you easy access to Lindarets, which links to Chatel and Switzerland. Prodains is the big telecabine that takes you directly into Avoriaz. The top of Prodains is usually the meeting point for a lot of the Avoriaz ski and snowboard schools. To get to Prodains, guests in our More Mountain’s catered chalets can get a lift in one of their minibusses or Land Rover. Alternatively, there is a ski shuttle bus that leaves Morzine every 10 minutes (the “A” bus route). Ardent is a bubble lift that takes you to directly into Linderets. You can take a 20-minute drive to Ardent through Montriond and past the lake, or catch the “M” bus. There is a nice run from the top of the Linderets chair, nicknamed Star Wars. This blue run is a great blast through the trees all the way down to the bottom of the Ardent bubble. There is a great bar called Happy Hours at the bottom of the lift. It has great food and it gets very lively for Aprés drinks, especially on Wednesday, when most of the seasonnaires have their day off. Lindarets is a large bowl with a number of mountain restaurants and chairlifts. It is a great meeting point for lunch and has lots of nice runs here, and some easily accessible off-piste. This area is also where you need to head to if you want to go to Chatel and Switzerland. It is also the starting point of the Portes du Soleil Circuit. One of the more popular runs in Lindarets is called Prolays. Running from Avoriaz to Linderets, Prolays is an easy, wide blue with a nice gradient, ideal for practicing your turns. It also has lots of opportunities to practice little jumps from the side of the piste. When you stop on this run, please be careful where you stand, as you may come in to contact with a skier or snowboarder at about head height. Chatel has lots of runs for all abilities and some great off-piste. 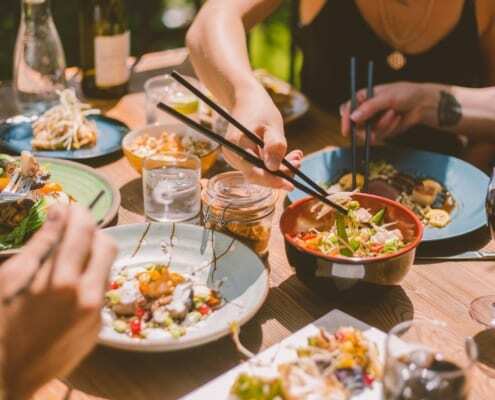 In the Plaine Dranse area, there are lots of great mountain restaurants to choose from for lunch. For a real “experience” at lunch, book into Chez Babeth, it has great food and Babeth herself will keep you entertained. If you want to go for a blast on a really long piste head for Linga. It is quite steep at the top, but there is an easy blue to the right-hand side. Keep in mind though that this run does get a bit icy in the mornings until the sun has been on it for a while. Yes, you can ski to Switzerland from Morzine. The Swiss resorts in the Portes du Soleil are worth a visit. They’re not as busy as the French resorts, which means that they are ideal to go to during school holidays to get away from the crowds. In half term, it’s entirely possible to have a slope to yourself in Morgins. You can get to Switzerland via the Mossettes lift from Linderets or dropping over the Swiss Wall. If you are unaware of the Swiss Wall, it is a steep piste giving access from Avoriaz to Les Crozet. It has an incline of about 40 degrees with unavoidable moguls the size of a car at the top. The first 50 metres are the hardest, the rest of it is just a huge steep mogul field. It can be quite fun in a “that was a good workout” kind of way, but if you are inexperienced or just don’t fancy it, you can catch the Chavanette chair down. Where are the best shops? Skiers wanting some new boots or skis may want to pop into Beanies. Beanies is a really nice bar, but it has a specialist ski shop downstairs. They are very knowledgeable and their customer service is excellent. If you want something a bit cheaper, go to the large Intersport. The ground floor has a wide range of ski equipment while the top floor has lots of clothing. For snowboard clothing and hardware you can’t go wrong with going to Slope Style and the Woods. These two shops are located on the Rue du Bourg. Burton, Jones, Analog and Union are just some of the brands to choose from. They also sell streetwear and accessories. There are a few supermarkets in Morzine. The large Carrefour in the bottom of the valley is best for a big shop for self-catered guests. There is a Spar in the centre of town and a Casino shop. Morzine has its fair share of places to eat. You will find many traditional Savoyard for your fondue and tartiflette fix, but there are alternatives too. There are other non-cheese options as well if you have dietary requirements or just fancy something different. It is worth knowing that most people working in Morzine have their day off on Wednesday. This means bars and restaurants get booked up pretty quickly. So it is worth booking a table for Wednesday night early on in your stay. The Aprés scene in Morzine is great. There are always bands and DJs to listen to during happy hours priced drinks. There are plenty of places to choose from to have a quiet drink too. The Tremplin is always pretty lively during aprés time, as is the Tibetan. Bar Robinson at the bottom of the Rue du Bourg is always a favourite, but remember to drink the Mützig in halves! So what are you waiting for? 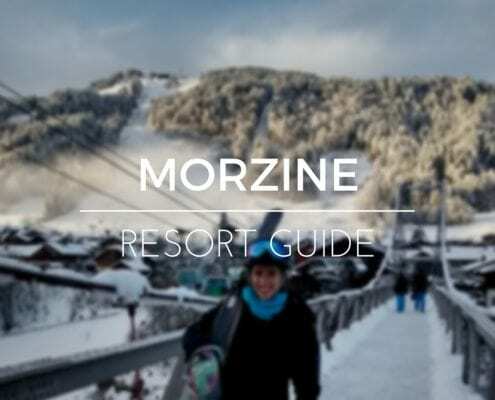 Hopefully, all that info helps you plan your first trip to Morzine before you arrive in the wonderful place. Guest post by Tom at More Mountain.